James Chadwick (1891-1974) came from a humble background: his father was a cotton spinner. He was accepted in the physics department of Sir Ernest Rutherford at Manchester University in 1908 on a scholarship, and soon started publishing new findings about radioactivity. This led to a traveling scholarship to Berlin, where he made the important discovery of the continuous spectrum of β-particles. When the World War I broke out, Chadwick was interned by the Germans as an enemy alien for the next four years, but continued experiments in the prison camp. On his return to England in broken health, Rutherford invited Chadwick to join the Cavendish Laboratory in Cambridge where he became Rutherford’s deputy and oversaw much groundbreaking physics research over the next 15 years. Chadwick concentrated on finding evidence for the neutron, an uncharged nuclear particle whose existence was first proposed by Rutherford in 1920. Having noticed anomalous results from the Curie laboratory in Paris in 1932, Chadwick used simple bench-top apparatus to convince himself, after weeks of intense observations, that he had definite evidence for the existence of the neutron. The Nobel Prize for physics followed in 1935; that year he moved to Liverpool University to head his own department. At the outbreak of World War II, the feasibility of atomic bombs of unprecedented explosive power was already being discussed. 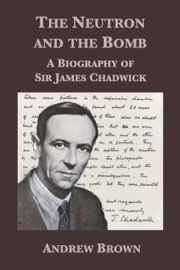 Chadwick drafted the British MAUD committee's historic reports in the summer of 1941 which concluded that atomic bombs were indeed feasible with sufficient industrial capacity. In wartime Britain this was impossible, but in 1943 Chadwick moved to the US as head of the British scientists working on the Manhattan Project. He formed an unlikely alliance with its leader, General Leslie Groves, and became an adroit scientist-diplomat. Witnessing the first explosion of a plutonium-fueled device at the Trinity Test shattered him. Chadwick believed that dropping atomic bombs on Japanese cities was justified but the development of nuclear weapons as an unintended consequence of his discovery of the neutron caused him deep personal anguish.